"The Hope of the Family" (Ignatius Press) responds to mistakes in understanding marriage in society. Vatican City, Aug 5, 2014 / 02:06 am (CNA/EWTN News).- In a book-length interview, Cardinal Gerhard Mueller has underscored that the indissolubility of the marriage is no mere doctrine, but a dogma of the Church, and stressed the need to recover the sacramental understanding of marriage and family. The book can be considered Cardinal Mueller’s definitive contribution to preparations for the next synod of bishops, dedicated to the family, which will take place in Rome Oct. 5-19; he has chosen to give no further interviews for the time being. 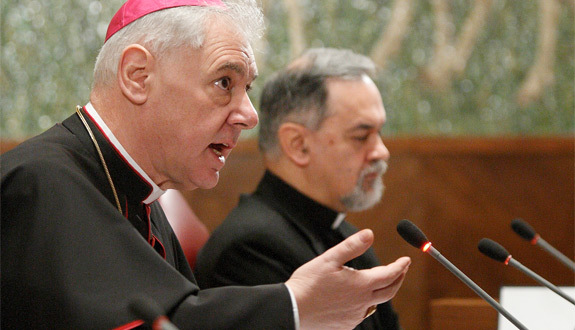 The synod’s theme will be “pastoral challenges to the family in the context of evangelization,” and numerous outlets have speculated about a possible change in Church teaching regarding the reception of Communion by those who are divorced and remarried, as well as a more lax discipline regarding annulment. These poorest of the poor, these orphans of divorce, are most often found, not in materially impoverished nations, but in Europe and North America – some of the world’s wealthiest places.